Non Profit: Professional Membership Organization dedicated to patient-centered integrative model of pain care; AKA “The Academy”; represents broad variety of health care professionals; emphasis on integrative and interdisciplinary approach to pain care; online and print publications, credentialing, find a provider tool; home for SPPAN. 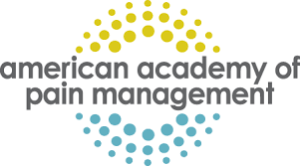 The mission of the American Academy of Pain Management is to improve the lives of people with Pain by advancing a person centered, integrative model of pain care through evidence-guided education, credentialing, and advocacy. The Academy defines Integrative Pain Management (IPM) as a model of care that: is patient-centered; considers the whole person; encourages healthful lifestyle changes as part of the first line of treatment to restore wellness; is evidence-based and brings together all appropriate therapeutic approaches and clinicians to reduce pain and achieve optimal health and healing; and, encourages a team approach.